Ivana Busljeta Banks, conference chair, and her team organized a wonderful ICORIA. Co-organized by the EAA and the Zagreb School of Economics and Management, the 12th ICORIA took place in Zagreb, Croatia from June 27 to June 29, 2013. Following the interesting and enlightening keynote lecture by Prof. Sanjay Putrevu of University at Albany, the participants from 23 countries took part in 24 parallel sessions of the conference, during which 86 papers were presented. The conference topic, "To Boldly Go…" Extending the Boundaries of Advertising, was reflected in the topics covered by the papers presented, as well as in the adventurous spirit of the conference and its participants. Take a look at the conference video and photo gallery to enjoy the atmosphere of ICORIA 2013 on the EAA website. At the general assembly of the 12th ICORIA, which was held on June 27, 2013, Shintaro Okazaki has been voted as the new President-Elect of the EAA. Shintaro will follow Edith Smit as EAA President in 2014. Shintaro's function as publication manager for the book series "Advances in Advertising Research" will be taken over by Patrick de Pelsmacker. Moreover, the delegates confirmed all board members by their voting. Thus, the EAA board is constituted as follows: Edith Smit (President), Shintaro Okazaki (President-Elect), Ralf Terlutter (Past President), Peter Neijens (Past President), Sandra Diehl (Treasurer), Patrick de Pelsmacker (Publications), Tobias Langner (Information Manager), Martin Eisend, Robert Heath, and Sara Rosengren. EAA's 13th International Conferences on Research in Advertising (ICORIA) will be held on June 26-28, 2014 in Amsterdam, one of the most beautiful cities in the World. The conference will be organized by Edith Smit, Peter Neijens, Peeter Verlegh, Eva van Reijmersdal, and Hilde Voorveld. Around 100 papers on topics related to advertising and marketing communications will be presented during the two days of the conference. The venue will be "Pakhuis de Zwijger", a former warehouse at the waterfront of the IJ River, which now serves as a cultural meeting place for creative and innovative people. During the conference, several social events will be scheduled. Deadline for submitting a five-page paper abstract is February 15, 2014. More information will follow in the Call for Papers, which will be launched soon. We look forward to seeing you in Amsterdam in 2014! The European Advertising Academy calls for proposals for the venue of the International Conference in Research on Advertising (ICORIA) to be held in 2015 and 2016. The main objective of the ICORIA is to offer a platform for the exchange of experience, views, ideas, and expertise among advertising scholars and practitioners, and thus to enhance, disseminate and stimulate high quality research in advertising. Therefore, natural candidates for venue and local organizer are universities, research institutes, or other organizations in the field in Europe. The conference is typically organized at the end of June and attracts roughly 200 delegates, representing more than 40 countries. 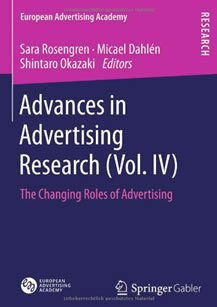 A selection of the best papers is published as a volume in Advances in Advertising Research series by Springer Gabler. The ICORIA takes place over a period of 3 days with a welcome reception on Thursday and the main conference on Friday and Saturday. The host institution's students and teachers are encouraged to be involved in the development of the conference. Please send your initial expression of interest and a brief proposal for the venue and local organizer(s) to Dr. Edith Smit, President of the EAA and Venue Committee (info@icoria.org). Any questions you may have regarding the organization of the ICORIA, please feel free to ask. Deadline for proposals is November 30, 2013. The EAA is next to several international renowned organizations one of the co-hosts of the Global Marketing Conference at Singapore. The conference will be held from July 15-18, 2014 with the theme "Bridging Asia and the World: Globalization of Marketing & Management Theory and Practice." 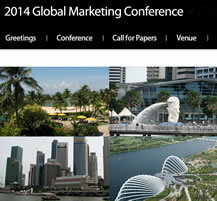 More information about the Global Marketing Conference is provided here. EAA is proud to be part of the conference and looking forward to seeing several EAA scholars in Singapore. 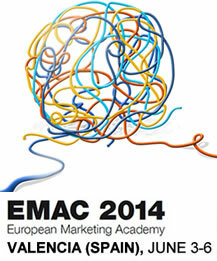 We are very honoured and proud to have been asked to chair the Advertising, Promotion and Marketing Communication track at the 2014 2014 European Marketing Academy Conference (EMAC) that will take place in Valencia, Spain next year. We are currently looking for reviewers and hope that you would consider adding your name to the reviewer database. Reviewers will be sent 1-3 papers and as you might know EMAC submissions are short papers (5 pages). The papers will be sent to reviewers around mid-December and reviews will not be due for at least a month. If you are able to help us and review a short paper or two, please complete the registration form. The reviewer registration is open until November 17, 2013, but if you are interested in helping out why wait. Sign up today! The Department of Communication Science at the Faculty of Social and Behavioural Sciences of the University of Amsterdam invites applications for a full-time Assistant Professor position. Closing date for applications is October 8, 2013.